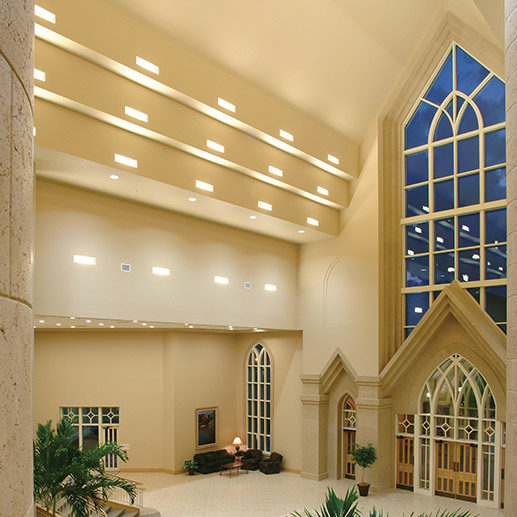 This contemporary interpretation of Gothic style architecture was a stunning success for the Asbury United Methodist Church. The entryway’s lofty peaked ceiling and expansive dimensions were designed to inspire a sense of awe. Additionally, designers used the “Hole in the Wall” fixtures to fill the space with volumes of indirect light to evoke a feeling of God’s presence. The cast GRG (Glass Fiber Reinforced Gypsum) portion of the fixture blends with the wall, while the metal fixture housing is nestled within.